Coming up with fun decklists so you don't have to. 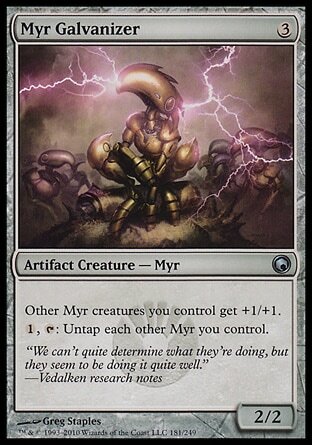 - Myr Reservoir and Palladium Myr produce huge amounts of mana which makes it a breeze to cast the Myr Battlesphere. - Myr Reservoir and Emeria, the Sky Ruin allow you to bring back Myr from the graveyard constantly. - Myr Galvanizer and Tempered Steel combined will give your army +3/+3 minimum. - Myr Galvanizer can untap your entire army after they've attacked to then tap them all to the Battlesphere for some rather intense damage output. - Perilous Myr and Darksteel Myr are incredible blockers. - Perilous Myr can be brought back continuously thanks to the Reservoir and Emeria. This gives you a repeatable burn spell. 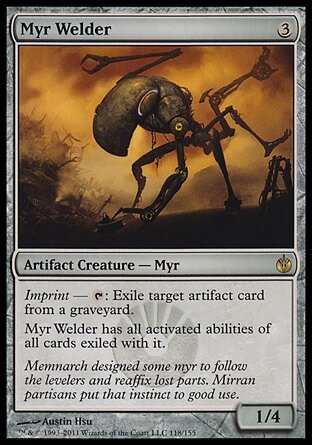 - Myr Welder can take on the role of any fallen myr or the Myr Reservoir. - Myr Galvanizer, Voltaic Key, Crab Umbra, and Mirran Spy allow you to untap to your heart's content. Cryptoplasm might just help out as well if you so desire. 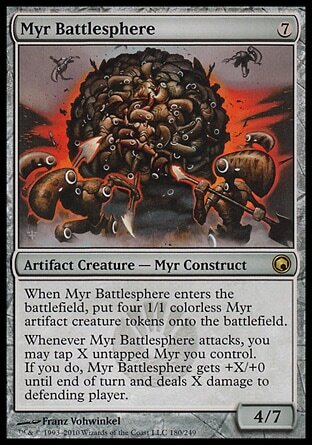 - Untap effects allow you to abuse Myr Turbine, Steel Overseer, and Myr Battlesphere: Searching for any Myr you want with ease, giving your entire army piles of +1/+1 counters, or doing 20 direct damage before they can declare blockers. - Cryptoplasm and Myr Welder team up to become copies of almost anything in the deck which means three times the amount of abuse and consistency. - Tons of mana Myr join forces to bring out an early Hellkite Igniter and then power up its artifact-based firebreathing ability. - Ichor Wellspring plays nicely with Kuldotha Rebirth. - Backup plan: infinite mana means Comet Storm is lethal to as many targets as necessary. This is Kylak signing out and hoping you adopt a Myr or two of your very own.